Customers and friends often ask me about how I think of designs for bears, how long they take to make, do I dress bears ? And, one of the questions which comes up is whether, or not, I make female bears. 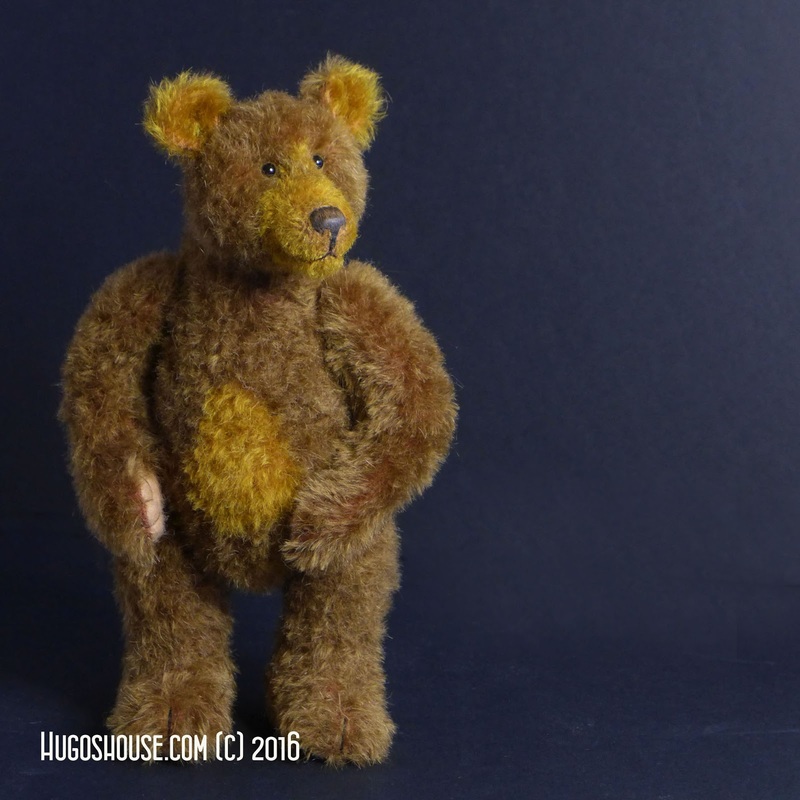 I suppose the truthful answer is that I am not entirely sure how a bear appears female when it is finished, so I have rarely actually set out with the intention of a bear being female. I made a set for a charity auction many ( many ) years ago which was called mother and cubs. The cubs were smaller and more cubby in proportion, but the parent bear could have just as well been father from its appearance, since it was a "grizzly" type bear with no means of indicating gender by clothing. I made a little tableau once, I purchased doll house scale accessories and built a kitchen in a cave. I had a table covered in food of all kinds, a cooking range and just about everything a cave kitchen would need, and to take charge of this kitchen I made the single smallest bear I have ever attempted, probably only about 4 inches tall, possibly even smaller ( no I am not making another one, I don't even have the pattern any more ). The little bear was unclothed, I hadn't considered its gender but almost everybody who saw the piece assumed it was a mummy bear preparing food for the family, so the conclusion was reached due to their gender role perception, not any intent on my part. The original owner sold it on and I have no idea if it still exists, I have no photos but if anybody out there knows the whereabouts of "bear in kitchen" I would like to know if only to have a photograph. Anyway the point being that I didn't consciously make a female because I wouldn't really know how. Sometimes a bear becomes female simply because I have been inspired by a name, I once named a bear Rosa, it was red ( rose ) and white in a panda design and I had been listening to recordings of Rosa Ponselle ( if you don't know who she was take a moment to google her name, feel ashamed for not knowing and listen to the lady who some regard as the stand out great Soprano of all time ) . Many people dress bears quite elaborately and thus many become female because of their attire, I have never really dressed bears beyond a waistcoat, so even then gender is not necessarily obvious. However recently I was following on Facebook the development of a litter of Newfoundland dog puppies, 2 boys and a girl. One of them was a particularly fluffy, chunky adorable white and black one, one day a picture was captioned with the name chosen for her, "Daisy" it just seemed perfect and if I had been lucky enough to be able to adopt her I would have happily called her Daisy. And that's how I ended up naming a bear Daisy, I have never done it before but I set out to make that bear look as cute and fluffy as Daisy. 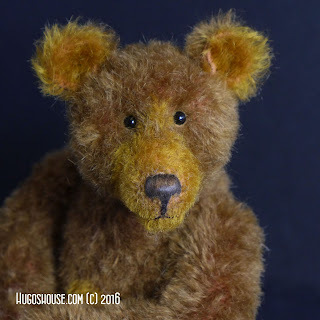 I think I achieved lady bear just by softness and perhaps leaving her face fuzzier than usual, and by chance I found a piece of vintage cloth in my mum's childhood supply of doll making materials. I did start to make Daisy a little dress from the fabric which had blue daisies on it, but it was heading more towards lampshade so I abandoned that in favour of a generous and flamboyant bow. Her pictures received many kind compliments on Facebook, some people remarking that they like my girl bears, so I have resolved to make some more, having said that I am still not sure how, but watch out because I think I may have to make a dress for the next one. 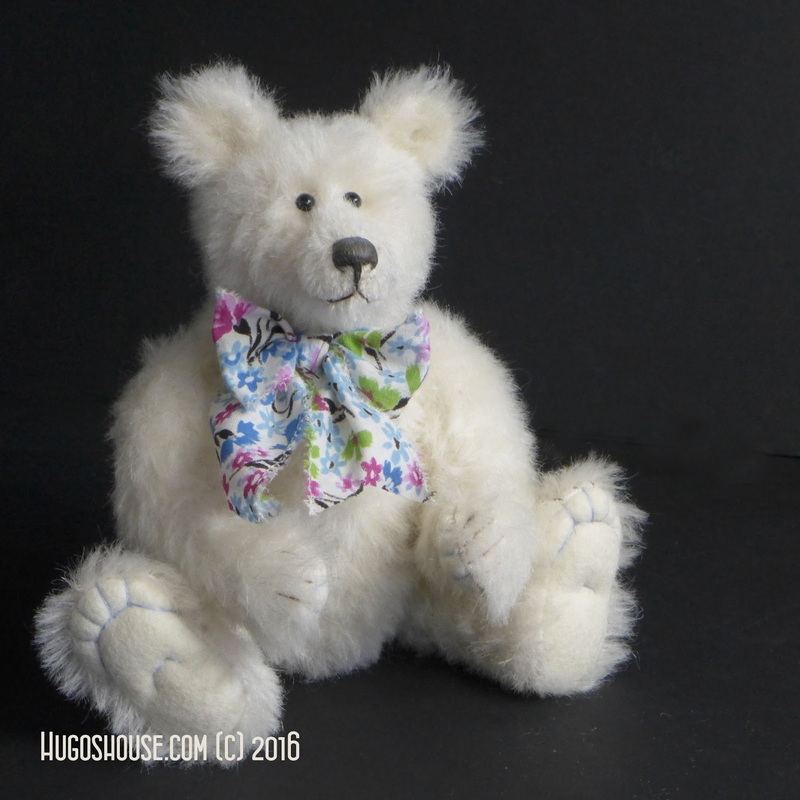 Daisy is the smallest size pattern I use at the moment and she stands at just under 8 inches tall. Incidentally and entirely a co-incidence, Daisy and her namesake puppy both went to their new owners on the same day. If you have visited my website, or looked through my Facebook pages, or even my Twitter Feed, you might notice that I never really make much commentary about my bears. I have a brief outline of what I do and my ideas in fairly broad terms but I don't really go to much detail about techniques. I don't show work in progress often, I am too untidy and it just looks a mess. I have always left it to others to comment on the merits or otherwise of my work. If I have ever mentioned such things it is more likely to be here on my blog which I seem to have neglected lately. However, I did something recently which I am going to mention because I am proud of having found the patience to tackle it. 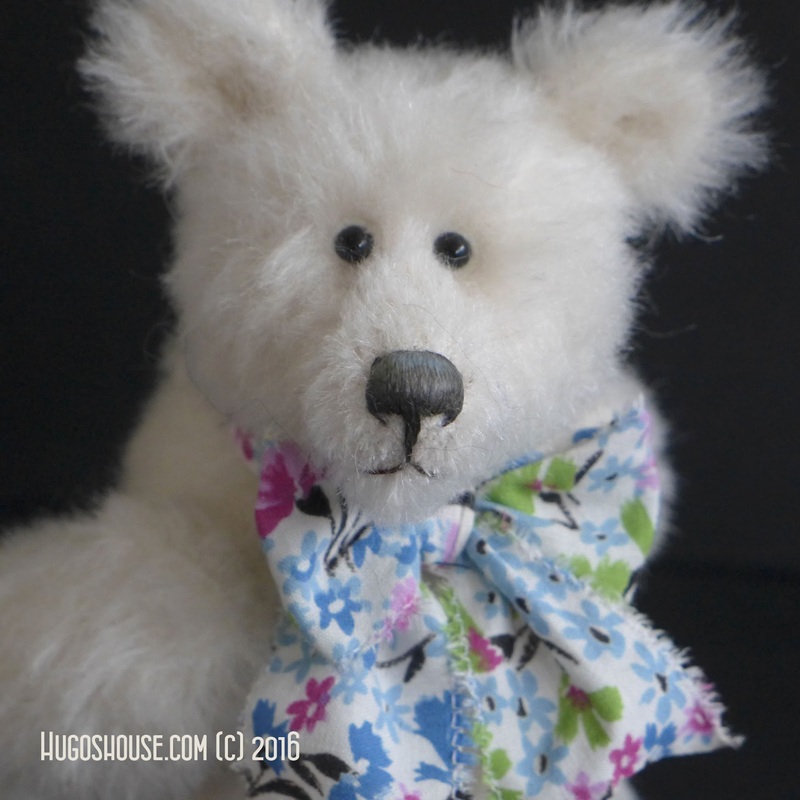 I made a new bear, I had given him an inset snout in a lighter colour to create a contrast on this particular pattern I had made changes to give him a longer snout and I wanted to soften the division between the colours. The usual way to achieve this softening is to use ink and airbrush to blend and shade. I have never got on with airbrushing, I had a nasty experience with a whole bottle of lightfast waterproof ink and my carpet many years ago and vowed never to go near an airbrush again. Anyway my solution was to harvest individual tufts of hair from each colour cloth and replant them across the bridge of the snout so the transition between the colours was slower. Its something I have done before to restore lost tufts on an old bear but to undertake the grafting on a new bear and be able to do the work economically is probably rather rash. I spent the best part of a day underneath my magnifying lamp and I am pleased with the result but as I finished I wondered if anybody would notice so I decided that, just for once, I would blow my own trumpet and say that this was very fiddly indeed, I am proud of the result but no, I probably wont do it again. To give you an idea of the scale, the bear, Greville, is about 10 inches tall.